Each and every Friday at BOGOF Bingo there are 7 whole hours of free bingo fun where you play for free but can win real cash prizes! So in addition to the daily 11am til Midday and 11pm til Midnight sessions you can now visit the BOGOF Heaven Room between 6pm and 11pm where every second game of bingo is free! So that’s 2 hours of free bingo every single day and a generous 7 hours on a Friday giving you plenty of freebies and a cracking start to your weekend. 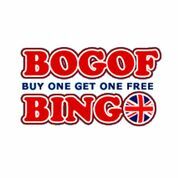 As well as free bingo you can also get you Buy One Get One Free Bingo for 11 hours a day between Midday and 6pm in the BOGOF Happy Room, and then from 6pm til 11pm in the BOGOF Heaven Room so you can make your money go a lot further by and play a good few free bingo games on BOGOF Bingo! Weekends have just got interesting at BOGOF Bingo as there’s the chance to win a cash prize every time you buy a bingo ticket. You could win £10 or maybe even £1000 and it’s your to spend on anything you like so stock up on those weekend tickets and see if you’re in for a nice cash prize surprise!